I guess blogging really can be therapeutic. After I posted Friday about our trip to Birmingham regarding the ketogenic diet, I just didn’t feel right. I had a tightness in my chest that I hadn’t experienced in a long time. Anxiety? I couldn’t stop obsessing over our appointment with the neurologist and how she just wasn’t on the same page at all. I guess it’s true what people say about going with your gut. I looked back over my correspondence with CHOA. I had never cancelled our March appointment just in case. Connor is already responding so well to the tweaks in his diet that aren’t even the full-blown MAD or ketogenic diet. I went upstairs to find Chris and said, “you know…we still have the CHOA appointment, and the nutritionist said she could help me start MAD at home…” And within seconds it was confirmed that neither of us were comfortable moving forward in Alabama with that neurologist. So I emailed the nutritionist that we would be sticking with CHOA and I am waiting to here from her. 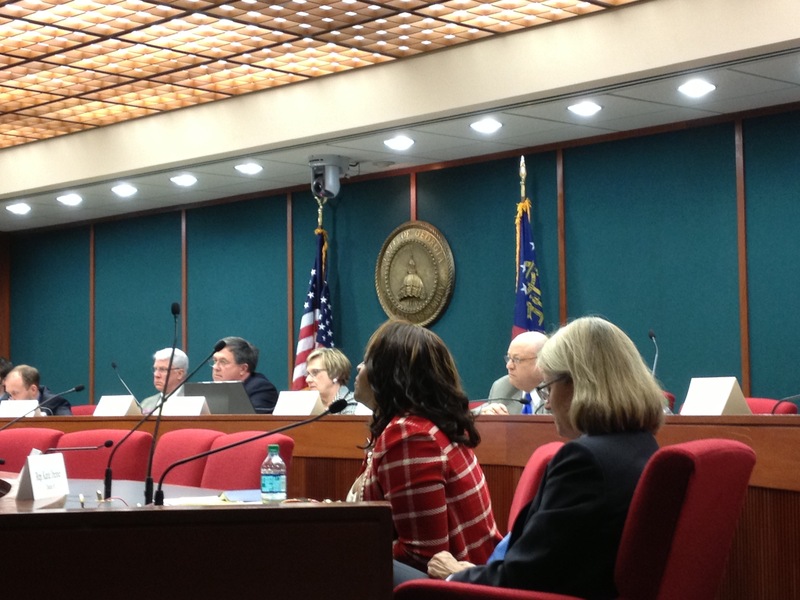 Yesterday I attended the first committee hearing on HB 885. I don’t know what I expected, but it wasn’t what I got. It started late as the morning session had gone long. Some members came in late to the hearing as they were at other meetings that overlapped. Paige Figi — Charlotte’s mom featured in the Sanjay Gupta special — flew in with Joel Stanley from Realm of Caring to testify about what they are doing in Colorado and the success they are having. They are in the process of getting FDA-approval and they are doing studies, but it is a time consuming process and children with severe seizure disorders don’t have time to wait. They explained that they are a heavily regulated industry. They also said they now have a waiting list of over 2,000 people nationally and internationally, hoping they will be allowed access. Dr. Mike Green then testified and shared that the Medical Association of Georgia supports the bill. Dr. Smith testified about his experiences having a child with a seizure disorder (Doose syndrome) and the awful side effects that can come with seizure medications. He and Dr. Green also shared about the Epidiolex drug trials that are going on. Epidiolex is manufactured by GWPharma using CBD as the active ingredient. Dr. Smith tried to get his child into one of the studies, but they were full. Dr. Flamini also testified. He is the neurologist to many of the kids whose parents are fighting for this. He is actually the mysterious neurologist I frequently refer to in this blog. He is very supportive of CBD studies and is applying for Investigational New Drug status (IND) so that he can work with Epidiolex in his office. It is a very lengthy, difficult process to work with a schedule 1 substance, but even if he is approved he is very limited in how many people can use it. Though he was testifying in support of HB885, he is actually excluded by the bill because he has a private practice. It would only be available via research hospitals. I also want to point out that Epidiolex is in trial phase and not yet FDA approved. It has been granted orphan status, which speeds things up, but we’re still talking years. May I remind you that vigabatrin was not FDA -approved in the U.S. until 30 years after the first trials. Ahem. Several parents shared their heartbreaking stories. Janea Cox shared about Haleigh, pleading with the committee not to let her daughter die. Aaron Klepinger shared about the amazing success their son Hunter is having in Colorado and how badly the family wants to come home. One dose stopped him from clenching his fists so tightly that his hands would bleed. Jonathan Jiles shared about his son Kason’s battle with Ohtahara syndrome. Sgt. Chris Clark, a 26-year veteran of the police department shared about his family and how his wife and child are in Colorado for treatment while he remains behind to provide income and insurance. He also shared that his son had a brain surgery that caused a stroke. I wished they could have had more time, but were all rushed because of time constraints and the impending bad weather. Then came the oppositional speakers with lengthy presentations. Sue Rusche from National Families in Action opened with a YouTube video she took of an advertisement for Indispensary in Colorado. Dispensaries are where you can buy marijuana products. It took me a while to ascertain her point, but it seemed to be, hey, look at all these recreational marijuana products. These are available in the same place as where some of these Colorado parents are obtaining their child’s medication. It was a long, slow video with lots of silent footage of recreational products. Personally, I was shocked it was allowed to play out in full considering the rush for time and that testifying parents had to talk quickly. It was also quickly pointed out by Rep. Kaiser that it was irrelevant. Georgia is not Colorado. This is not what we are doing here. That is simply a place in Colorado where medicine may be picked up, but we wouldn’t have that here. We are interested in a non-psychoactive oil that can’t get you high only ONLY; recreational is not on the table. We want an oil form, not buds. Rusche was clearly not supportive of products such as Charlotte’s Web which has saved many lives in Colorado. She pushed the Epidiolex trials repeatedly and insisted it was not hard to get, that any doctor can apply for IND status and have it in 30 days. This was after Dr. Flamini already testified that it was a difficult process. The doctors behind her were also shaking their head as she spoke. But no matter what was asked, she insisted that Epidiolex, courtesy of GW pharmaceuticals was the only suitable option. She was so insistent that one of the reps eventually questioned whether her organization received money from GW. A representative then asked her if Epidiolex is so easy to get, why aren’t these parents doing that? “I wish they would!” was her response. And at this time, I ask you to recall above where I mentioned that one of the testifying doctors tried to get it for his kid and couldn’t. At that point, Rep. Peake asked her, ‘Would you tell Aaron Klepinger to stop giving Hunter Charlotte’s Web and get in line for Epidiolex?” She said no. Some doctors from CHOA spoke. While they have reservations, they are very interested in possibilities of CBD oil. Then Rick Allen of the Georgia Drug and Narcotics Agency spoke of the challenges of getting it here due to it’s classification as a schedule 1 substance — no doubt a major hurdle. He said that where we stand, something like Charlotte’s Web cannot be brought into the state legally. University of Mississippi is the only place permitted by law to supply as part of research projects. Then came, what was for me, some of the most disturbing testimony. Karen Tinker gave lengthy testimony as a mother of a son with epilepsy. I was confused at first. Why was she at the end rather than with the other parents? Why have I never seen her or heard her name before? As it turned out, she wasn’t testifying for the bill. She was testifying against it. She started out with a similar story. Many meds failed her son and he recently received the VNS implant, which she acknowledged comes with it’s own dangers, and wasn’t guaranteed to solve the problem. She talked about her methods of evaluating treatment options for her son, and said that she had chosen not to use Onfi because of potential side effects (a med that I felt we had to try for Connor). But she stated that CBD oil did not have the research to back it. That we needed wait to several years to see what studies would say. She likened the passing of the bill to opening Pandora’s Box and said she worried that all the positive headlines about marijuana would lead her teenage son to try recreational pot. After the fact, I saw her Linked In profile. It turns out she owns a company that provides mobile drug testing of employees to companies. She doesn’t seem to differentiate between medicinal and recreational. It was heartbreaking that a parent of a child with seizures would do this to other parents. Especially after Janea Cox had cried and shared that Haleigh has stopped breathing 56 times in the last month. I respect the right of every parent to choose the course of action for their child. Not every parent is comfortable with medical cannabis at this point and I respect some would not opt to use it. Just as Tinker chose not to use Onfi, we did choose to use it. I do not respect someone that tells others they shouldn’t do something that could save their child’s life. I am so lucky that Connor’s situation is not as dire as the situation of the testifying parents. It’s cruel to try and stand in the way of something that could save their lives. After that, a couple doctors testified that had been recruited by Rusche. I’ll be honest. I didn’t hear much of what they had to say because I was still in shock over Tinker’s testimony. At that point the hearing had hit three hours and it was an hour and a half past when it was supposed to end. The remainder of speakers were asked to return to the next hearing. I’m not sharing all my thoughts at this time on the hearing in the blog. If interested, I can talk more one-on-one. I will provide more detail at a later date. All I can say is that yesterday was an eye-opening experience. Previous PostOut of the closet…….Next PostAcceptance or Denial? I understand your reservations with the doctor you saw, I once had a neurologist for my son, while living in Georgia. I had just heard of the keto diet and asked about it at his next appointment. Now, I REALLY liked and trusted this doctor but when I asked about the diet he said, “It amounts to nothing more than a scoop of mayonnaise on a piece of lettuce.” Well, that wasn’t going to work! But the diet kept popping up in conversations, in articles I read. So, a short time later after returning to Florida, I went back to Shand’s in Gainesville, determined to insist on trying the diet but to my surprise before I could give my speech, the neurologist suggested it. As it turn out, the first neurologist was completely wrong, not sure if he just wasn’t informed and didn’t want to look stupid or if he is just anti-anything that doesn’t involve drugs, I don’t know. Sadly, we have tried the diet several times but didn’t have much improvement, at one point my son even refused to eat at all and we were forced to stop it BUT, I do believe in it and what it can do for some. It is just like a drug, each patient reacts differently, what works for one, may not work for another, and it has to be tweaked for each patient, just like medication needs to be and I was very lucky to have a great Nutrition Department, that work with us to create meals for him that he would like and were similar to what he would normally eat. Wish you the best! I am not interested in another lab created drug, little is know about Epidiolex, I looked at the website and could not find any real information. Like, what’s actually in it or possible side effects. Big Pharma is scrambling to find a way to control it’s profits, they stand to loose billions as more people turn to medical marijuana for treatment and cures. Personally, I am for whole plant legislation, as I do not want to stand in the way of anyone, regardless of their condition or disease, to be denied a cure or at the very least relief for their symptoms. I want a natural remedy, that has been used for thousands of years, is currently being used with positive results, studies have been done with positive results for many different diseases, including cancer. Studies done by our own government, that can be found on the governments National Institute of Health’s website. (nih.gov) I want the right to choose! Thank you for the feedback on the diet. We’re optimistic as he has responded to the simple things I have already done. It was a similar experience. This neuro looked at us like we had three head for wanting to pursue this. I definitely understand what you are saying about Epidiolex. I feel much as you do. I would love for this option to be available to everyone who needs it, and I think cannabis has been demonized to ridiculous levels. I know whole plant medicine is important. Unfortunately, states like Georgia are going to take a long time to get there. My hope is that this bill is just a starting point for all that can benefit. Plus the FDA hangup makes me crazy. The FDA drags its feet and some of its practices could be questioned. They took 30 years to approve vigabatrin! People had to buy it from Canada, as you well know. It wasn’t approved. Not to mention that many of the meds are not approved for young kids. Connor’s two meds are approved at ages 2 and 10. He’s only 23 months. I will never understand such ignorance (Tinker). It should be available for us regardless of others’ opinions. It’s a potentially life saving medication not a recreational drug. Why would any mother not want to prevent another child’s death? As far as Onfi is concerned, if it had been allowed in the US 13 years ago, Bethany’s seizures might have gotten under control back then, not just one year ago. Now don’t get me wrong. I still believe med. marijuana would be much healthier and more effective than any medication with horrifying side effects, which is pretty much all of those that are legally being used now! We need some good advice here. Some needed help. My niece is 3 and she has been on every medicine to try to stop her seizures. On a special diet. They don’t stop. They are coming more often in a day and getting stronger. Do we have to help my family to move to another state. Or can we get help here to get law passed in arkansas. I believe god creates every living plant for a reason. Why can we use it!!!!! !